A well-developed root system is the key to overall growth. Our grow bags provide roots with a healthy environment, allowing them to thrive and develop to their full potential. Vegetables, flowers, herbs and fruits all grow well in fabric bags. It's also a good option for a flower garden in a limited space. There are several key benefits and features of this smart grow bag. Easy to Plant and Transfer Each bag is made of high quality and durable non-woven fabric with sturdy handles for easier, more secure lifting and moving. Healthy Root Growth Environment Designed with superior breathable fabric to promote faster plant growth through better aeration, it provides water drainage to stop overwatering, better than the plastic salver. Durable and Reusable Gardzen grow bag is sturdy and can be used for several years. When not in use, can be folded flat for easy storage. Fine Workmanship Stitch length an inch may not be less than 7 needle to ensure our grow bag is durable. No Worries Guarantee: Quality and service is our first priority. We can refund your money if don't like your grow bag and you can keep it too! BUY YOUR GROW BAG TODAY, RISK FREE! Your plants will thank you. Their root structures will thank you too! ✔ Material & Size: Non-woven fabric. Pot Dimension: 12.2" Diameter 11.4" Height. Approx. 5.78 gallon, larger than others. 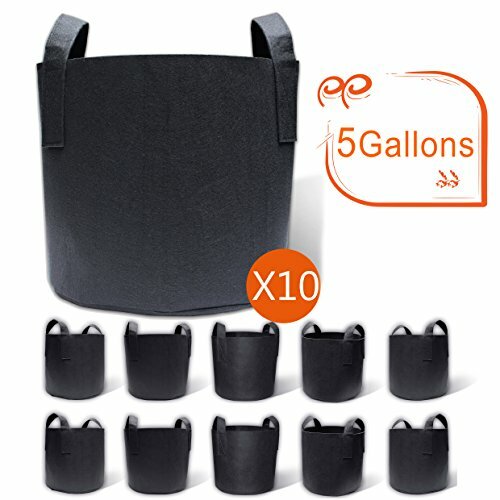 ✔ What You Get : 10-pack 5 gallons grow bags. ✔ Feature: Good waterproof, air permeability, can bring the whole soil ball full of root, more uniform than plastic salvers. ✔ Easy to transplant: The soft, light, breathable and durable bag with sturdy handle straps allows easy and safe moving. ✔ 100% SATISFACTION OR MONEY BACK GUARANTEE - If you don't like your grow bag, or whatever, you could contact us and tell us your reason, we'll instantly refund your money and you can keep the grow bag, no question asked, just a prompt, courteous refund! If you have any questions about this product by Gardzen, contact us by completing and submitting the form below. If you are looking for a specif part number, please include it with your message.